Have a special project that requires an experienced team? Let Ed be your strategic partner in building and running your plant, Acquisitions, Decisions, Board Seat , Planning , Questions or just another person to bounce ideas off of. Plant layout and expansions with proven results over past 40 plus years. This includes new plant acquisitions, plant analysis, equipment choices, employee evaluations, upgrade consulting, controls upgrade, plant layout reviews and recommendations. 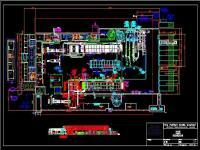 Designing the most efficient plant layout is critical, and so is providing specifications of required bakery equipment. Our reputation for innovative machinery designs and problem solving is without equal. Our bakery plant and equipment knowledge has helped dozens of brand-name bakeries. Our commitment to you as a customer is to provide the highest level of product quality and personalized customer service in the industry. Problematic equipment solutions services are part of our repertoire. Ed Fraschetti developed the first rotary blade scoring systems in the USA and Europe in the early 1980’s. Some systems require turning and re-turning of pans or peels. 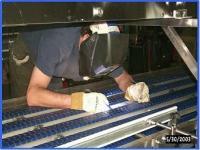 To obtain proper angle, we can help you provide the conveyors and options like proving pins. Others include servo systems for more accurate adjustments, as well as menu-driven recall for many products. A well-designed and well-built machine is only half the battle; it also requires a control center programmed with precision. Whether you are requesting basic parts and service or help with redesign or retrofit of conveyors to better suit your applications, we’re here to help. We possess the experience and field knowledge to get your bakery running again at peak performance. Whether you are requesting basic parts and service or help with redesign and retrofit of conveyors to better suit your applications, we’re here to help. We offer installation and spare part packages, as well as training for your work force on system operations, maintenance and safety for all our equipment. These service options, provided by our highly trained technicians, get you started and keep your equipment up and running.